Period Elegance with totally modern performance! The sliding sash window, often referred to as a 'Georgian window' reflecting the period when this style reached the peak of popularity, is a classic window design. It has a timeless elegance and beautiful proportions which enhance the appearance of almost any home - period or modern, town of country. Nor should we forget that the sliding sash window was created for highly practical reasons. It is one of the few windows that can be opened, for ventilation or easy cleaning, without intruding into the room or obstructing the exterior. So, it is no wonder that the vertical sliding sash window has remained a favourite design with builders and homeowners for centuries. Unfortunately the traditional timber sliding sash window also brings a number of problems. 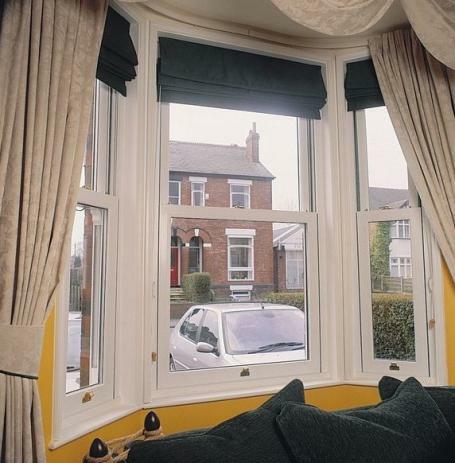 First, the ravages of the British climate can cause timber to twist or warp, leading to windows 'sticking', becoming difficult to open and close or, when the winds blow, the sashes can rattle in the frame creating a draughty nuisance. Second, the traditional 'cord and balance' mechanism feature, which ensures the sliding sash stays in position when the window is raised, can deteriorate and prove a difficult item to replace. And, of course, virtually all timber windows are painted or stained and require periodic maintenance...stripping, filling, sanding, priming, re-painting. So it was no surprise that many saw the replacement of timber sliding sash windows with new PVC-U versions as an easy choice. But frankly, these 'first generation' PVC-U windows failed to match the aesthetic beauty of the traditional window. The frames appeared 'clumsy' compared to the elegant sightlines of period designs. Yet, one leading British quality window systems company persevered. It took the latest computer aided 3D design systems, plus considerable investment to achieve the necessary combination of a slim but strong and durable frame. The result was worth it...the Warmer Windows vertical sliding sash window, bringing all the traditional beauty of timber sash windows and all the up-to-the-minute performance benefits of modern materials. This beautiful design means homeowners can now enjoy the best of both worlds, truly presenting a property to best advantage, with attractive aspects, whether viewed from the garden or interior. Plus all the benefits of trouble free performance, minimal maintenance (just a quick wipe with a damp cloth occasionally); modern mechanisms which are durable, long lasting and simple to replace or repair if things go wrong; and absolutely no re-painting!